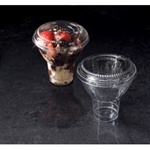 We feature a nice selection of plastic parfait cups and disposable sundae cups from some of the top manufacturers in the industry such as WNA and EMI Yoshi. These plastic sundae cups and dessert parfait cups are ideal for use not only in ice cream shops and restaurants, but also in cafeterias, supermarkets and hospitals, and for catering, receptions and more. This wholesale parfait cups selection includes elegant, heavy-duty “resposable” plastic units perfect for both casual and formal gatherings. They're reusable or disposable and can be purchased with or without lids. Available in bulk orders of 240 pieces each, cup inserts also come in cases of 1000 each. EMI Yoshi Plastic Resposable Parfait Cups Clear - 6 Oz. EMI Yoshi Plastic Resposable Parfait Cups Clear 9 Oz. EMI Yoshi Plastic Resposable Parfait Cups Clear - 12 Oz. Parfait Cup Insert - 3.5 in. x 1.25 in. Parfait Cup Insert - 2 Oz. Speciality Parfait and Dessert Clear Pet - 6 Oz. Speciality Parfait and Dessert Clear Pet - 12 Oz. Speciality Parfait and Dessert Clear Pet - 9 Oz. Classic Parfait Dessert - 12 Oz. Speciality Clear Pet Parfait Dessert - 5 oz. Speciality Clear Pet Parfait Dessert - 8 oz. Classic Parfait Dessert - 16 oz. Classic Parfait Dessert - 9 oz. Buy your wholesale parfait cups from the leader in restaurant supplies!